Barnes & Noble’s Nook Tablet is shipping two days ahead of its original Friday release, following same early release path taken by the Kindle Fire, which made its debut a day earlier than anticipated. Customers who preordered the Nook Tablet for in-store pickup have been alerted that their purchase is ready, and online orders have been arriving on front steps everywhere, a company official told CNET. 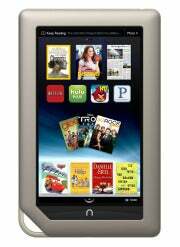 The Nook Tablet is expected to hit brick-and-mortar store shelves on Thursday. The Nook Tablet and Kindle Fire -- both priced for impulse sales at $249 and $199, respectively -- have a lot in common in terms of specs, with the main differentiator being the Nook Tablet's slightly higher price and its internal and expandable storage capabilities (the Kindle Fire has 8GB built-in with no expandable storage, whereas the Nook Tablet has 16GB built in and a MicroSD slot). But it seems that Amazon and Barnes & Noble have found that immediacy and availability is another factor to wage war on. Now that both are readily available, will you pounce on these bargain-bin priced tablets, or ignore (for now) the pricier-but-more-capable iPad 2 (or iPad 3)?